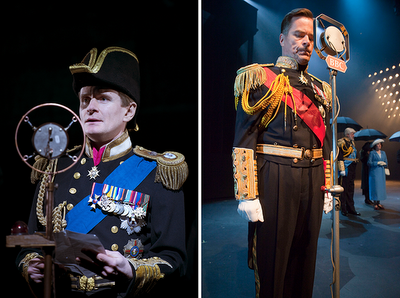 The kings giving a speech: Charles Edwards on the left, Carl-Kristian Rundman on the right. 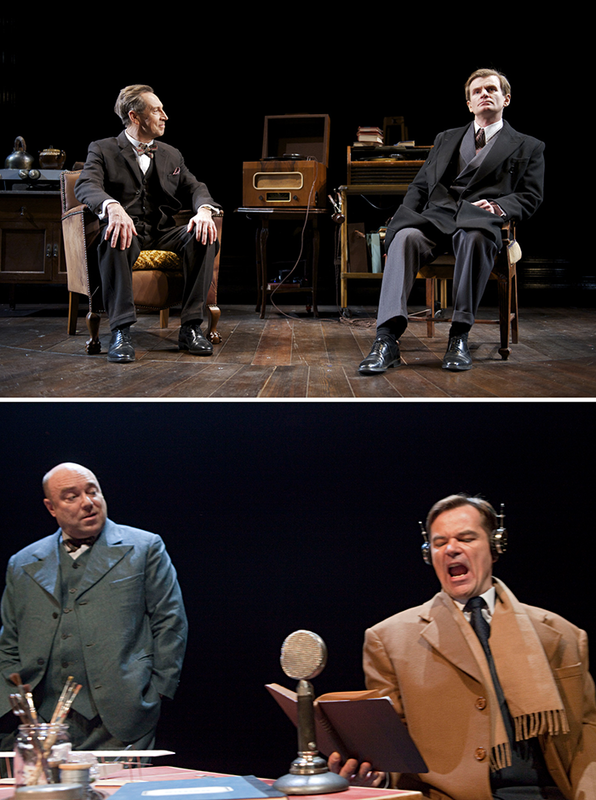 Last spring, I was lucky enough to see both the West End and Finnish versions of the play The King's Speech. With musicals, it's surprisingly easy enough to see multiple versions of the same thing. Everyone (or at least several theatres in each of the Nordic countries) wants to have their own Les Mis, Next to Normal, Evita. You even have the term hit musical. Hit plays, on the other hand... Before this, I hadn't much considered seeing two productions of the same play. I had hardly considered seeing a straight play at all. 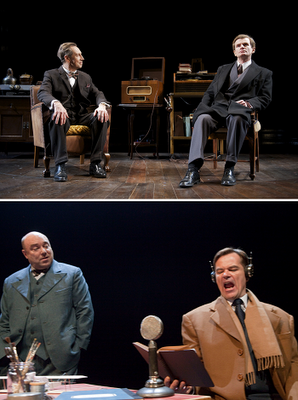 However, earlier this year, The King's Speech (or Kuninkaan puhe) premiered in Helsingin kaupunginteatteri. I saw it in April, and a month later, I found myself in London during the last week of performances of the West End version. I consider The King's Speech, a real history based story about King George VI's struggle with stuttering and finding his place as the monarch of the Great Britain, a great story in any form. I loved the movie, just like the rest of the world did, and found the play just as good. I rarely cry while seeing musicals, even though most of the ones I enjoy are about dying and misery, but this play made me shed tears quite uncontrollably just when the curtain fell. In both countries. I think the whole concept of royalty is interesting. How come it's possible that in 20th-century-and-onwards Europe, there remains a system where certain people officially have a certain stature just because they happen to be born to a certain family? I like how the play addresses those issues. Not to mention I think there's always something very interesting about stories that are based on real events. Taking lessons. Jonathan Hyde and Charles Edwards on top, Pertti Sveholm and Carl-Kristian Rundman below. I've been trying to make decisions (for the whole summer, it seems, since this post has been sitting in my drafts since May), but I don't think either of the casts I saw was stronger than the other. There were stronger individual performances, and maybe by mixing people from both you could have a sort of an ultimate cast – but as a whole, I enjoyed both casts about as much. If I have to find differences, I think the Finnish one can boast a slightly stronger speech therapist Lionel Logue, portrayed by Pertti Sveholm. I thought his performance felt a tad more genuine than his British counterpart's, Jonathan Hyde's, though Hyde wasn't bad at all either. There's a fun story relating to that bit of casting, though. The movie Titanic is one of my all-time favourites. So, you might've recognised the name and thought I was over the moon to see an actor who had a prominent role, as J. Bruce Ismay, in my favourite movie. Well, I'm sure I would've been – if I had known it was him! I simply didn't recognise Hyde onstage, nor did the name ring a bell. Back at hotel, I leafed through the programme and started thinking that no way, this says he was in Titanic, and he kind of looks like... could it be... I blame the lack of a moustache! But resuming to the casts. I'm afraid Vuokko Hovatta is one of those actors who simply annoy me, no matter the role. I've yet to see her in a part I'd honestly enjoy her in. True to my sentiments, I found her Elizabeth slightly annoying and lacking much emotion whatsoever. Therefore I enjoyed the British Elizabeth, Emma Fielding, better. Thinking about the other major female role – if we're being superficial, West End's Myrtle Logue, Charlotte Randle, seemed a bit too young to me. I don't know her actual age age, but she has such a young look I felt she could've almost been Jonathan Hyde's daughter. I preferred the Finnish version, with Eija Vilpas as Myrtle, since the couple seemed closer to each others' age. When it comes to actual performances, though, I think the both did a good job. Continuing the nitpicks, I found the Charles Edwards's stutter, as King George VI (or Bertie), more believable than Carl-Kristian Rundman's. Then again, I don't really know anyone who suffers from stutter, not anyone Finnish nor anyone who speaks English. So who am I to judge? Other than that, I'm afraid I can't pick a favourite king, they both gave great performances. Unlike the casts, the stagings differed a lot. Musicals, no matter if non-replica or not, tend to be staged a bit similarly everywhere. So, it was interesting to see how much the visions can vary when it comes to staging a play. I think Helsingin kaupunginteatteri's big scene is simply too big. I think there's too much space even for the hugest productions, like Wicked. But here, for once, the emptiness worked for the piece's advantage. I felt the king's loneliness and helplessness more achingly when I saw him struggling to give a speech in the middle of the vast space. The West End stage, at Wyndham's Theatre, was a lot more intimate. While the smaller space usually felt better, and there was no need to keep ensemble howering awkwardly at the background just to fill the room, the extra space certainly added feeling to the speech and church scenes at Helsinki. HKT solved some of the space problems by adding a sort of a smaller stage, that served as a room, in the corner of the stage. In Wyndham's Theatre, then, they had a turntable with a big wall that rotated when there was a change from one space to another. I have to give a nod to Logue's office in the West End, it looked way more cosy there! Top, Michael Feast, Ian McNeice and David Killick as the Archbishop of Canterbury, Winston Churchill and Stanley Baldwin. 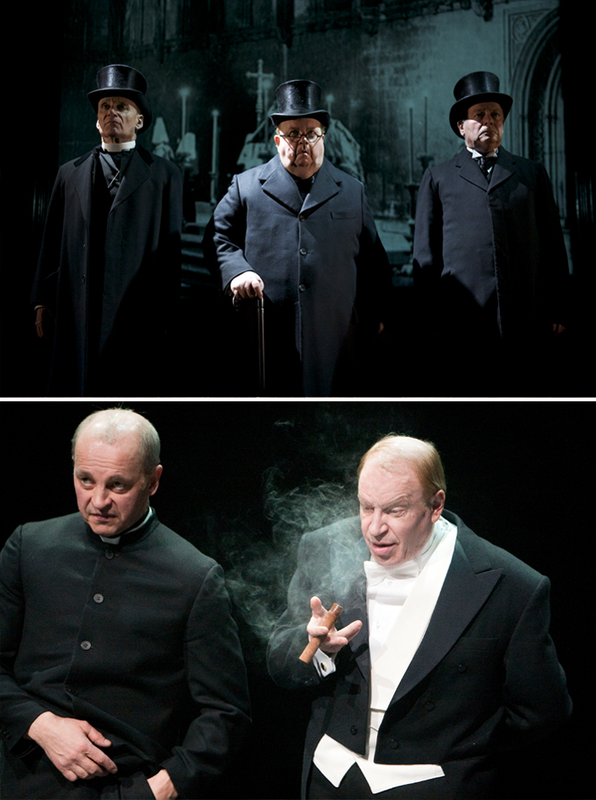 Below, Rauno Ahonen and Jari Pehkonen as the Archbishop and Churchill. Direction-wise, HKT's under Kari Heiskanen's helm and West End by Adrian Noble, there were of course differences. I think even the scripts differed a bit, in ways that can't be blamed for confusion in translation. For example, I seem to recall the scene where the leaders of the land discuss at the urinal had rather different lines depending on the country (also noteworthy: in Britain, the scene was not urinal-based). The West End version gave the Nazi threat more emphasis. All in all, and maybe not surprisingly, the British version felt a bit more reserved. I think one of the most interesting differences was at the very end of the play [here be spoilers!]. In the Finnish version, after the line Thank you... my friend, Bertie and Lionel hug. In the British one, there was just a handshake. The hug seemed like a very natural ending to me, and I was a bit surprised the West End version didn't have that. I felt it lacked something. Then I started wondering... maybe there are still some taboos considering the royalty in the UK? After all, even as a Finn, it's quite impossible to imagine the Queen hugging anyone. I guess that, to us Finns, the piece plays as any piece of historical fiction – maybe based on real events, but still fictional. If it suits the characters, we think it's normal when the King of Great Britain and his best friend share a brohug. But maybe that's too unbelievable for the British, some of whom might consider this not yet fiction but still real history? Or maybe I'm reading too much into this one little detail. After all, apparently you can have the King creatively and repeteadly use a variety swearwords in that one famous scene, no matter which country. In the West End, I sat next to a very nice old lady. Upon seeing me wipe my tears after the show, she opened a conversation, and told me she remembers the time George VI was crowned. To me, a Finnish teenager, the events portrayed in the play are very distant. Events like the ones the play's about don't feel very real to me. I know they have happened, but somehow it's a bit hard to believe. So, it was eye-opening to talk to someone to whom they're real memories from her own childhood. The lady told me she loves the movie and that she enjoyed the play a lot too. She was also a true royalist and expressed her sympathy when I mentioned us Finns only have presidents... So I suppose the historical characters and events have been treated with certain respect and style. I'm always curious to observe the audience reactions. I've seen the play three times now, twice at home and once abroad. Out of these, the first Finnish one had a dead audience, the second Finnish set seemed to be enjoying themselves a lot, but the British were simply roaring with laughter. I think it's a national difference. I've a feeling it's a lot quieter in Finnish theatres, no matter which show. At last, the triuphant speech. Charles Edwards on the left, Carl-Kristian Rundman on the right. Finally, I want to tip my hat to the British production for starting to renovate their theatre at the time I visited. I had bought the cheapest, worst balcony seat. When climbing upstairs, I found out the balcony's under renovation, and got relocated in the best seats of the theatre, right in the middle of the royal circle! That stroke of luck was like a cherry on top of a great experience. 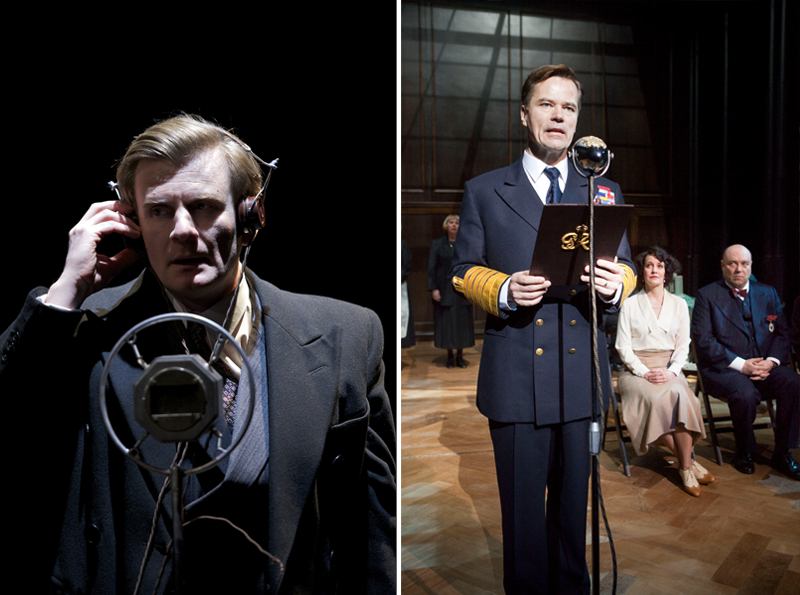 The King's Speech was, after all, the first West End play I've seen. I think I should see a straight play during every visit to London from now on! And when it comes to seeing straight plays in Finland, The King's Speech was also a bit of a first: it's the first play I've ever seen completely voluntarily, not for school credit or because someone invited me. I was surprised to enjoy it as much as I did, and I'll definitely keep an eye out for interesting plays in the future. Photos of the West End production from their website's gallery. Photos from the HKT production by Tapio Vanhatalo.